As Nigerians decide this Saturday, the umbrella body of Igbo organizations globally, Igbo World Assembly, IWA, and former Presidential aspirant, Chief Charles Udeogaranya have urged the Igbo extractions to ignore call from any quarter to boycott the presidential election. While lamenting what the group described as discord orchestrated by the enemies of Ndiigbo both internally and externally, the Diaspora group in a world press conference yesterday jointly addressed by Dr. Nwachukwu Anakwenze, Chairman, IWA; Christian Onuorah, IWA Vice Chairman and Oliver Nwankwor, Secretary-General, insisted that the people of the South-East should come out to participate in the democratic election without fear or favour. 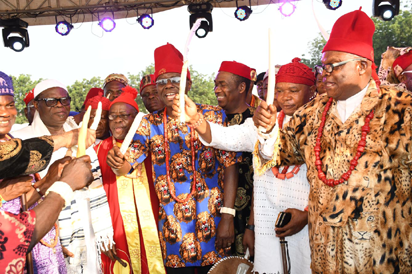 “IWA supports Ohanaeze Ndigbo as it works very closely with other socio-cultural groups across Nigeria including Afenifere, Northern Elders Forum, Pan-Niger Delta Forum and the Middle Belt Forum in endorsing the People’s Democratic Party presidential candidate, Alhaji Atiku Abubakar and Peter Obi for the 2019 Presidential elections. “IWA supports decisions taken by Ohanaeze Ndigbo in the pursuit of Igbo interest and not political interest. The decisions may not be acceptable to some individuals, groups and state governments, for their selfish politics,” the group noted. For Udeogaranya, Nigerians should use the coming presidential election to speak in an unequivocal manner in favour of good governance and against President Muhammadu Buhari’s marginalisation of certain people and ethnic groups in Nigeria. The former chieftain of All progressives Congress, APC, who has now pitched tent with the Peoples Democratic Party, PDP, made the assertion yesterday even as he asked Nigerians to go to the polling units and cast their votes against the incumbent President on Saturday. “Nigeria must reject and not re-elect the policies of economic hardship, insecurity, nepotism, wanton disregard of court orders and rule of law and sore intimidation of the Judiciary by President Buhari of APC,” he said. “Nigerians must enthrone a government that is well informed and have good plans that cares for the good and betterment of all Nigerians by voting in Atiku Abubarka of the Peoples Democratic Party PDP.